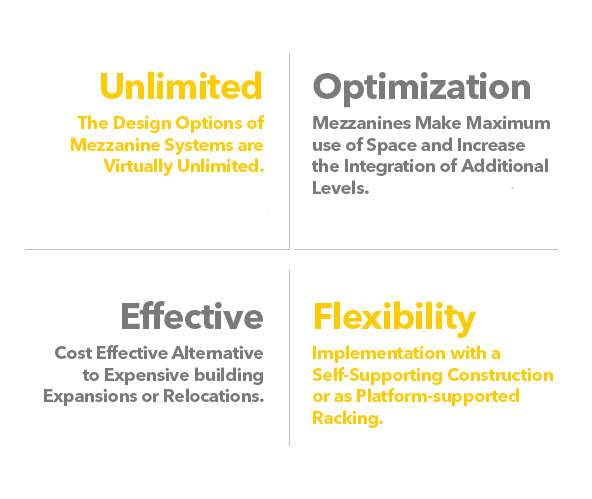 Our mezzanine systems grow in line with your needs, which means single-level systems can be expanded to create multi-level systems and get even more usable space. Our mezzanine systems grow in line with your needs, which means that single-level systems can be expanded to create multi-level systems and get even more usable space. Optimized plug-in and screwed joints allow on-site assembly without any welding. Quality work and maximum safety on all levels are our uppermost priorities. Multiple options and accessories to ensure the design fits your specific needs. 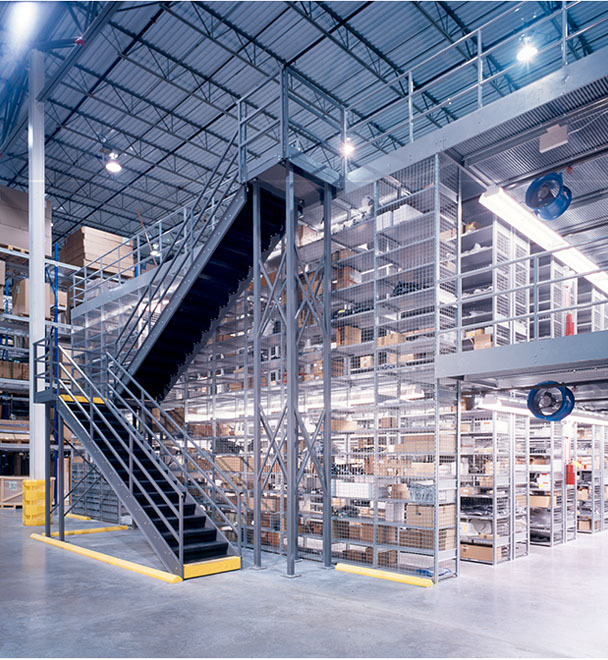 Self-supporting mezzanine systems provide plenty of flexibility in outfitting your warehouse. The layout and construction of the racking systems and workstations on the platforms can be adjusted to changing requirements. Our systems have optimized plug-in and screwed joints, and therefore allow on-site assembly without any welding. For our customers, this results in a quick implementation. 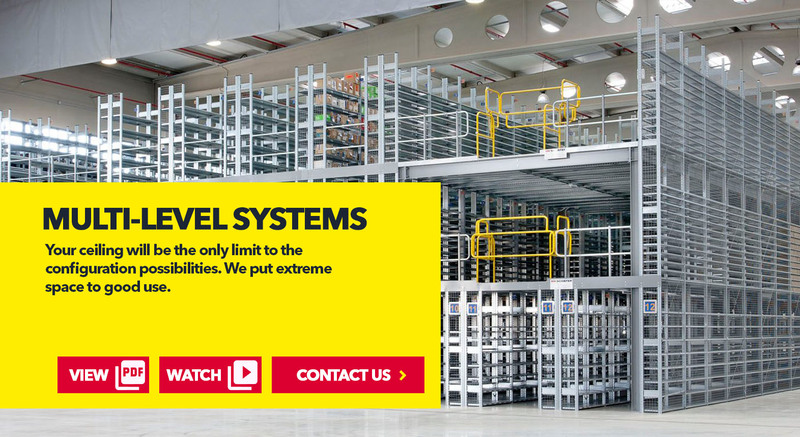 With racking-supported mezzanines, either aisles are built between the racking rows or complete platforms are built onto the racking units themselves. 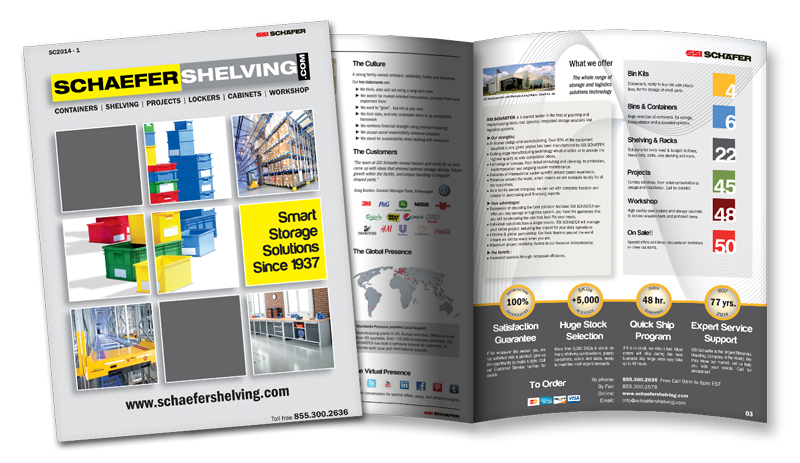 This means that modular shelving, live storage racking or pallet racking can be used as the supporting system. This method is mostly used when order picking is the primary task and/or additional conveying installations are needed. Depending on the requirements, we also implement these as multi-level systems. We are offering an exceptionally large range of upright patterns and support profiles, rails and pallet drop areas, floor coverings, stairs and stair rails as well as an entire range of lighting equipment. Our mezzanine systems made from cold and hot rolled steel can be erected quickly and easily. Mezzanices make maximum use of space and increase the available space in your warehouse through the integration of additional levels. They are a cost effective alternative to expensive building expansions or relocations. The design options of mezzanine systems are virtually unlimited. 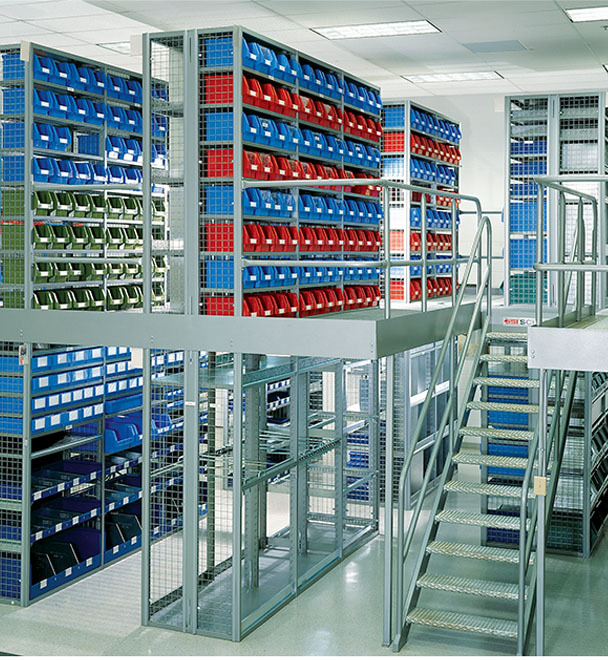 In combination with our versatile selection of shelving, workstation systems, boxes and containers as well as workshop equipment, simultaneous storing and working becomes a systemized method. 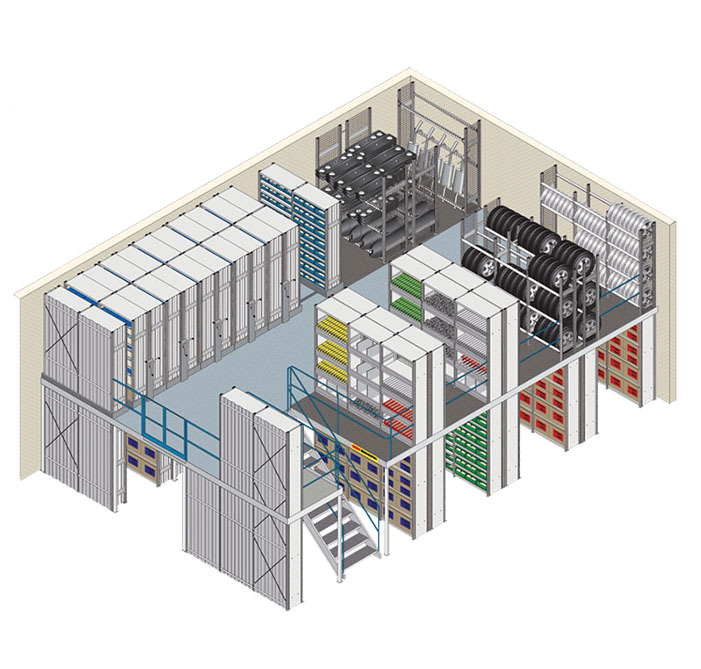 We will implement mezzanines with a self-supporting construction or as platform-supported racking. Both systems can be expanded in any lengthwise or crosswise direction, meaning that they are able to meet the specific load and other requirements at the site.